This Windows 7 tutorial shows how to change default browser in Windows 7. Often new web browser installations or browser updates change default browser setting and set default browser to IE, Firefox, Chrome, etc that you do not prefer to use as a default browser. Since I'm a web developer and a web publisher, I often download and install different web browsers. And although most of those web browsers ask during installation steps, to set themselves as default browser in Windows 7 or not. But sometimes the browser setup may not ask this critical question and change default browser to itself. After Opera web browser installation, I decided to prepare a tutorial on this topic. 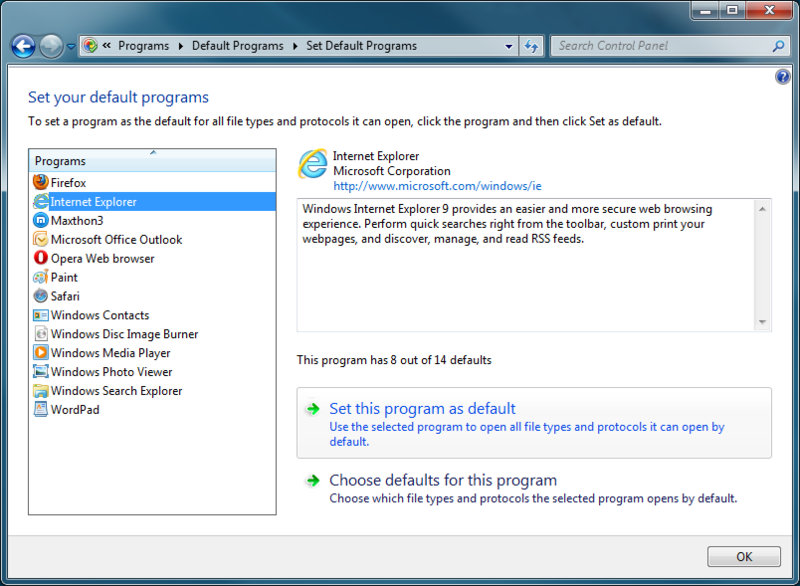 I'll demonstrate in this Windows 7 tutorial how to set default browser to IE in Windows 7 using Control Panel options. You can set your preferred default browser to any other web browser easily as you'll see below in Win7 Control Panel screenshots. The first step for setting default browser in your operating system Windows 7 is starting the Control Panel. Then choose Programs and later Default Programs. Using the Default Programs Windows 7 configuration screen, Windows users can manage all types of file extensions and the default programs associated with those file extensions easily. But instead of dealing with file extensions, I'll show you to change default web browser and set file associations related with web browsing in one step which is more easier and simple. Click on the link button "Set your default programs"
If you read the description text for the link, "Make a program default for all file types and protocols it can open. ", you can understand this is one step process to change default browser setting for many file types. Just click on the web browser you prefer to work with as a default browser and press "Set this program as default" button. As you see, I have already installed Internet Explorer (IE), Firefox, Safari, Opera web browser, Maxthon, and add Google Chrome to these web browsers list, you can understand how important is to change default browser to the one that you prefer most.